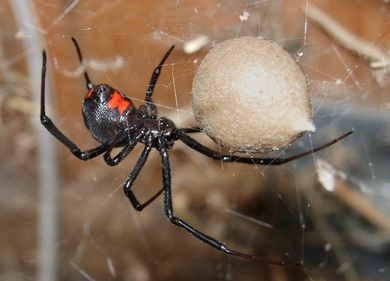 Black Widow spiders are black or very dark in color, with shiny bodies. They usually have a tell-tale red or orange colored hourglass shape on their bellies, but can occasionally have spots that are red, orange, or sometimes white. Widow spiders spin webs and hang around the center waiting for insects to get caught. These spiders are venomous and can be harmful to humans if bitten, but the bite is rarely fatal. They are one of two spider types in Virginia with venom that is dangerous to humans. To learn about American House Spiders, click here!